Summary: Alex, Marty, Gloria and Melman are still fighting to get home to their beloved Big Apple. Their journey takes them through Europe where they find the perfect cover: a traveling circus, which they reinvent – Madagascar style. It’s not often that three films into a franchise that the series seems to be getting stronger, but that is certainly the case with Madagascar because Madagascar 3: Europe’s Most Wanted could well be the strongest film in the series… sadly it also seems like it will be the last. This time around begins with Alex (Ben Stiller – The Watch, Towerheist), Marty (Chris Rock – What To Expect When You’re Expecting, 2 Days In New York), Melman (David Schwimmer – The Iceman, John Carter) and Gloria (Jada Pinkett Smith – Madagascar 2, TV’S Hawthorne) still trapped in Africa and beginning to believe that they will be stuck there forever as it is clear that the Penguins really aren’t returning for them. Still believing there is a way back to New York they head to Europe to find the Penguins but in doing so cause a disturbance that leaves the evil Captain Chantal DuBois (Frances McDormand – Moonrise Kingdom, Transformers: Dark Of The Moon) chasing after them, eager to add a lion’s head to her trophy wall. In a bid to escape Chantal and her mad cronies the New York refugees join a circus with the likes of Gia (Jessica Chastain – Lawless, The Dark Fields), Vitaly (Bryan Cranston – Total Recall, Rock Of Ages) and Stefano (Martin Short – Frankenweenie, TV’S The Cat In The Hat Knows A lot About That), but when they lie about their circus experience they are left have to proving themselves. There is absolutely no weakness with Madagascar 3: Europe’s Most Wanted at all. The screenplay works well and captivates the audience from start to finish. Even more importantly the film appeals to both adults and children alike, and despite the fact that there are jokes that are aimed for adults they certainly aren’t anything that is damaging to children. Credit must also be given to the three directors involved – Eric Darnell (Madagascar 2, Madagascar), Tom McGrath (Megamind) and Conrad Vernon (Monsters vs Alens, Shrek 2) – who for once used the 3D technology to enhance the film and not just as a gimmick. Together these filmmakers go back and visit the original fun that 3D can create, things appearing to be flying at the audience etc while the psychedelic 3D circus that they create is some of the best 3D animation that you are ever likely to see. The voice cast certainly come to the party as well, the usual cast are fine as always while it seems Frances McDormand really enjoyed the task of playing the ‘baddie’. The clear standouts however were Sacha Baron Cohen (The Dictator, Hugo) who seems to capture ‘fun’ in his voice like no other as well as Bryan Cranston and Martin Short who seem to enjoy playing around with some thick accents. 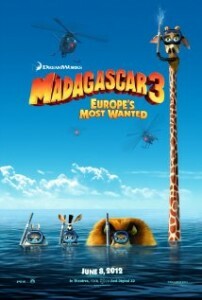 Madagascar 3: Europe’s Most Wanted is a sensational animation that needs to be seen on the big screen and in 3D.